"His capsule floated into a solar system that had been colonized less than a hundred years ago and a gang of asteroid miners found him. The capsule had taken up an orbit around an asteroid and they saw it flashing in the sun and got curious. Too much flash to it. Had dreams of finding a monstrous diamond or something. A few years longer and he would have crashed on the asteroid. Try to figure out those odds." Blake remembers almost nothing of his home planet - Earth. It is frightening, strange, and hostile. Even more frightening is his discovery of the two other creatures that inhabit his body. What are they? Where did they come from? How can he live with them? This classic novel resonates with today's science fact so eerily closely, it will challenge and delight listeners. This is Sci-Fi Master Simak at his powerful best. 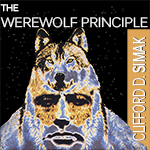 In more than 6 hours of dramatic audio, one of Simak's most provocative novels brings to life exciting ideas and themes even more philosopically and scientifically relevant today than the day he wrote it. Below are samples from this sci-fi fantasy classic novel.